The MiG-29 Fulcrum flies its highest in cold weather. In winter months, you can expect to fly up to 20 km high, to where the sky appears black above and blue below. That's the highest any civilian can currently fly. Contact us soon and we can have you flying high in February. Remember: no pilot's license is required. Virtually anyone in reasonably good health can fly. Schedule a personal zero-g training flight in Florida this winter. Flights are easy to schedule and are just $2500 per person. Flights take off from the Aurora Aerospace Training Center, at St Pete-Clearwater International Airport. For more information, visit our website or give us a call at 800-644-7382. Learn what it's like to sit at the controls of a legendary DC-3. 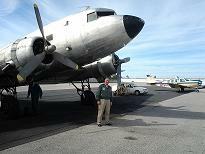 We now offer DC-3 flight training in two great locations. For details, call or email Incredible Adventures. Ripcord offers medical, security evacuation and rescue services from point of injury, illness or emergency, all the way home. In the event of a medical or security emergency, Ripcord's team of special operations veterans, Stanford Medicine affiliated physicians, paramedics and rescue specialists will act quickly to bring you to safety. To find our more about their services, visit www.ripcordtravelprotection.com. The Ultimate Adventure Experience is now available at The Florida International Rally & Motorsport Park, near Gainesville. Enjoy a quadruple dose of adrenaline for just $3799. Add lakeside lodging at a nearby luxury bed & breakfast for less than $200 a night. The FIRM is a 430 acre specialized training facility at the Keystone Heights Airpark in North Central Florida. Located next to the military's Camp Blanding, The FIRM is home to the RallyPro Performance Driving School and the International Security Academy. View our latest brochure here. To learn more, give us a call or send us an email. Enlist now for an upcoming Covert Ops Counter Terror Adventure. Two and four-day training missions are offered near Miami, Florida. For all the top-secret details, visit our website or send us an email. Need a Great Gift For Someone Special? Air Combat Adventures are available in cities across the US. Call 800-644-7382 to learn the location closest to you or click here.